PrideR By Freego™ - Standing Only, 2 Lightweight Parts, assembled in seconds. D. Security - All Types, POlice, Military, Apt's. - Standing Only, 2 Lightweight Parts, assembled in seconds. 1. PrideR: World's Most Revolutionary Scooter For All!. Below. 2. Online Gradual Price Reduction (Internet ) Goods & Services. 4. 28" Midget Hoist for vehicle maintenance. World's smallest hoist. Below. 6. P.C. Back-Up Invention: Details below. 7. Educational & Word Game Invention. Details below. SPECIAL: Pick 'Em All® Patent Inventory: 70% Off! For Everyone, and for Multi Purposes; Best Physically Challenged Transporter. The PrideR - A multi Purpose new standing only scooter- is also a gift of life providing mobility to many seniors (baby boomers) and others who wish not to walk long distance, or people who can stand and drive a scooter, but can't walk, and those who but feel SELF-conscious to use wheelchairs (for losing pride seen outside - due public stigma). Now they can “Stand ‘N ‘Walk’ ProudlyTM”. World’s only “standing only, slow moving" (Under 5 MPH, safer), 2 lightweight parts under 20 Lbs. patented scooter, which can be disassembled and put in a car trunk in seconds. *Standing only, slow moving, two lightweight parts, easy to carry and use. *Assembled - disassembled in seconds; easy to load into car trunk. *Users do not need to purchase a vehicle carrier. *Excellent for all purposes: Personal, Commercial, Industrial and Security. *Allowed everywhere for being slow moving. *Seniors and people with mobility difficulties, who can stand. 3% out of 70M. *Businesses, manufacturing facilities and warehouses. and drive a scooter can also use it. *Individuals – for personal use such as for leisure. The PrideR resolves walking issues, providing Mobility a: ability to get around in any environment, incl’d. malls, airport, hotels), and Mobility b: ability to drive the PrideR at any place by easily putting it in car trunk. The PrideR complies with TSA, and is allowed in airplanes. DEALERS, INVESTORS-PARTNERS, BUYERS ARE WELCOM! ADVANCED ORDERS: Individuals & Dealers! TEMPE, ARIZONA....Valley inventor Joseph Tsiyoni’s recent patent is a revolutionary, standing only, 3-wheel lightweight electric scooter, especially for people with limited mobility. Mr. Tsiyoni, inventor, executive auditor, author, President, Shairon Int’l. 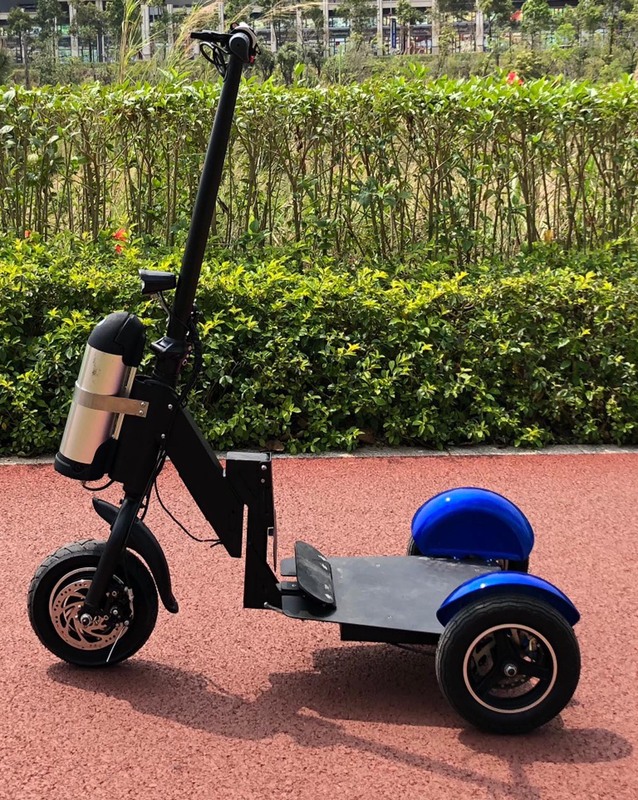 Trade, was granted a new patent for this ultra-nimble, ultra-portable scooter which provides transportation to all people in all industries. According to Mr. Tsiyoni, “This is the world’s only scooter of this unique design, one-of-a-kind, with my patented Quick-Attachment Mechanism”, making it a magical innovation that makes the PrideR„ usable for everyone that can lift only 19 pounds! 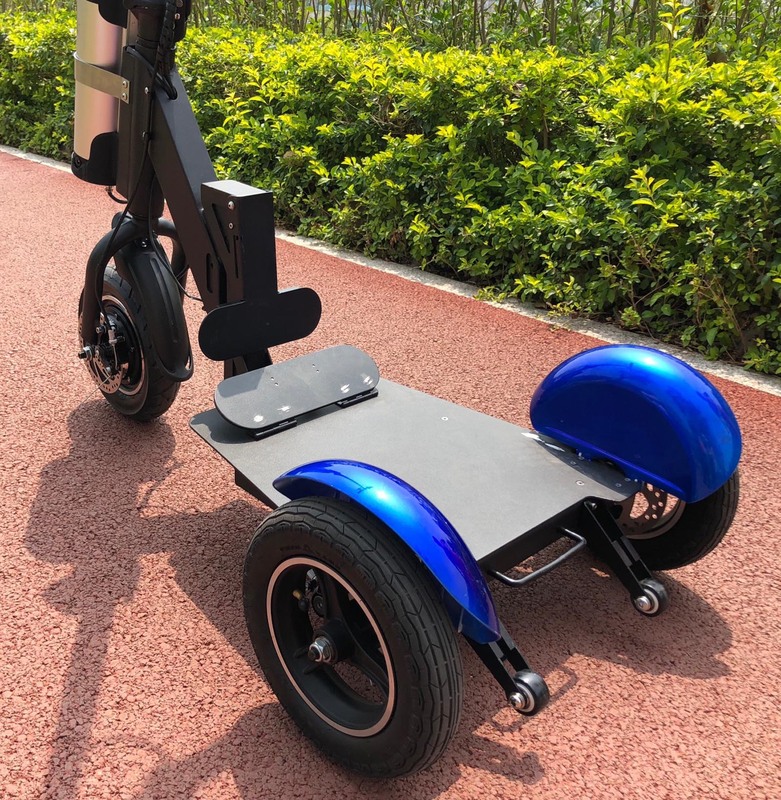 “No other scooter can be assembled and disassembled as easily and quickly,” and with such lightweight parts using his innovative patented structure. Mr. Tsiyoni has found that people who have trouble walking, but feel self-conscious using wheelchairs and therefore stay home, will truly benefit from the PrideR which gives those who can stand long enough to drive the scooter to their destination the gift of pride, so that they now can Stand ‘N ‘Walk’ ProudlyTM. Users can assemble and disassemble the PrideR in a matter of seconds and place it in a car trunk or elsewhere very easily, a capability which no other scooter provides. It is a low-cost design affordable to everyone. patented breakthrough design which enables fast assembly into two lightweight parts (each under 19 pounds). 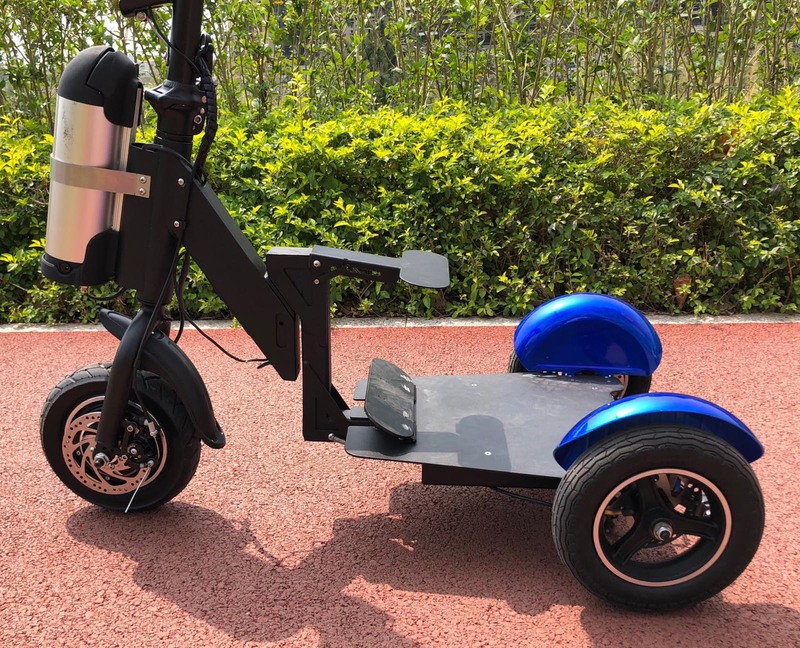 Simple for all, especially the elderly, and easy to use anywhere especially indoors or any place the Segway is not allowed, including narrow, crowded homes, public areas, and over steps and high curves. The PrideR makes most scooters obsolete (except for fast vehicles). It can be used for a variety of additional purposes, such as commercial, industrial, governmental, tourism, sightseeing, resorts, golf courses, trade fairs, security, police and military personnel. Shairon Int'l. Trade Co. develops, manufactures, and markets new inventions. REVOLUTIONARY Internet Trading Concept, process & System, which revolutionize the AUCTION- type internet trading, and brings more excitement. This invention will bring a new spirit to the internet trading of selling and buying goods and services. Tempe, AZ...Valley inventor’s Online Gradual Price Reduction Patent – Goods & Services (AKA ‘Internet Trading Patent’), a revolutionary patent, will most-likely change the internet and online trading of goods and services, including all auctions-type trading used by major retailers and auctions providers such as eBay. This new method is based on offering products and services at frequent price reduction until the product is ‘purchased’ before someone else can get it. For consumers, the inventions provides a new and exciting, revolutionary method of internet trading, felt from watching the price continuously reduce. That is far greater than what felt as the price constantly increases, stressing out the buyer for 7 or 10 days. The seller does not need to continuously update the posted offer. Trade is completed at the moment a buyer decides to ‘grab’ the product or service, which subsequently starts a new sale. This invention is based on a new copyrighted mathematical formula, which involves the creation of pre-programmed sets of a systematic price-reduction, enabling users to post goods and services for sale at the maximum desired price, and thereafter gradually reduce the price to a minimum desired selling price. The price reduction is based on frequencies and sequences of amounts of time, money and percentage, that are not publicly known. Shairon Int’l. determined that the traditional auction method has lost a significant amount of interest, so companies became more like online department stores rather than providers of exciting auctions. The constant decline of auctions, and the simultaneous increase of online selling, such as Amazon, and eBay’s “Buy it now,” reflect a significant decrease in auction-type sales. Most notably, the new invention will enable many companies, such as Wal-Mart, Kmart, JCPenney, Amazon, Sears, and Best Buy to brilliantly complement the existing price marketing models, which according to Mr. Tsiyoni, “Will start a new era of internet and online business”. Shairon Int'l. Trade Co. was founded by Joseph Tsiyoni in 1989. It develops, manufactures, and markets new inventions. It also owns Dollars-AD, LLC, and online advertising site. Among other inventions, the company developed and manufactured PrideR™ Scooter patent, and “28” Midget Hoist,” the world’s smallest hoist. BET MAINTENNACE TOOL FOR VEHICLE OVER 2,000 lBS. This is a VEHICLE PARTS PULLER of 15 parts by one (1) man only! On the ground. No. 5 INVENTORY & ®Trade Name FOR SALE! World's best Universal Random Number Selector for all games of chance. The Rgistered Mark is also for sale. Patent and Registered Trademark for sale. Also, entire inventory of 2,700 is for sale. Pick 'Em All Â®: World’s smallest and best random number selector for all games of chance in the world. Note: While W/S price is $2.25, we offer the entire inventory of 2,700 Picks for only 75 cents each + Shipping. A Hand-Held random number selector, including all Lotteries, PowerBall, Mega, racing, Keno, Roulette, etc. NO BATTERY NEEDED! Solution to the back-up Â nightmare. This is the most significant invention in the area of computer accessories. AÂ P.C. DEVICE which resolves a computer user’s nightmare of computer hard disc failure and/or loss of programs, files and/or software, especially when time consuming is critical to complete computer work (operation) or inability to immediately repair the damage. The device IS A SMALL ACCESSORY to be connected to the computer, thus enabling a new method of backup, which does not exist. It is inexpensive, easy to use, and revolutionary. A Revolutionary Educational Game - Makes Boggle Obsolete). WORKING PROTOTYPE READY FOR MANUFACTURING. This is multi-purpose, hand-held device, light-weight, a fun to play with, hand-held game, which can be used anywhere at home, while traveling in cars, airplane, train, or at school, playground, etc. It is also a good group game, enabling a few children to play together and compete. WORDS;Â MATH; COLORS; NUMBERS; LANGUAGE; ALPHABET; SKILL DEVELOPMENT; SPELLING IMPROVEMENT. .......and Furniture. Patent Pending. Please contact for info. Bikes, Furniture, and other items. Thus ninnovative improvemnet invention for sale including ntghe patent pending. Introducing PuzzleSick„ó (PuzzleStix)„ó, A toy puzzle more difficult than the Rubik™s Cube. PuzzleSick™ is intended to become the new world™s toughest challenge to people. Buyer or partners are wanted for the purpose of manufacturing and marketing the PuzzleSick„ó worldwide. The product s made of wood, thus extremely easy and inexpensive to manufacture. Potential buyers or partners should submit background information, current occupation and place of work, position, and indication of financial ability to pay for the transaction. (C)Copyright 1988-2014, Shairon Int'l. Trade CO., All Rights Reserved. No part of this entire web may be copied in any form without written permission from Joseph Tsiyoni.